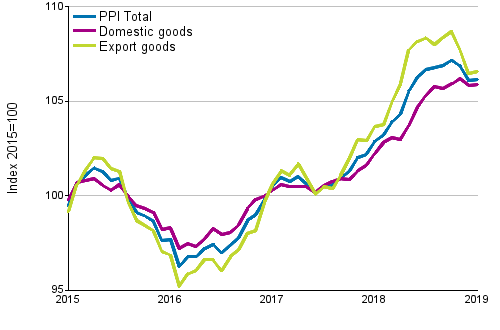 According to Statistics Finland, producer prices for manufactured products rose by an average of 3.2 per cent from January 2018 to January 2019. Producer prices for manufactured products sold on the domestic market rose by 3.5 per cent, while the producer prices of export products went up by 2.8 per cent. The rise in the producer prices for manufactured products was particularly caused by increased prices of pulp, paper, paperboard and cardboard, electricity and chemicals and chemical products from January 2018. The rising of producer prices was curbed above all by falls in the prices of oil products. The Export Price Index rose by 2.7 per cent and the Import Price Index by 1.1 per cent in the year. The Basic Price Index for Domestic Supply went up by 2.9 per cent. The Basic Price Index for Domestic Supply including Taxes went up by 3.2 per cent. Export prices were, in particular, boosted by the higher prices of pulp, paper, paperboard and cardboard, and chemicals and chemical products from January last year. The rising of the prices was curbed above all by falls in the prices of oil products. The rise in import prices was in turn particularly caused by higher prices of electricity and chemicals and chemical products compared with last year’s January. The rising of the prices was curbed above all by falls in the prices of oil products. From December to January, producer prices for manufactured products rose by 0.1 per cent. The rise was mainly due to higher prices of electricity from the previous month. The calculation of the Producer Price Index is reviewed starting from the Index for January 2019 so that the indices are annual chain-linked indices. In practice, the shift to the chain-linked index method means that the weight structure of the Producer Price Index will in future be updated every year. The new weight structure will take effect starting from the Index for January of each year. In addition to the weight structure, product categories and the enterprise sample can also be updated annually, if needed. The base year of the Index remains unchanged (2015=100). In future, the index calculation will be made so that each index series is chained forward with changes in the Index calculated according to the new weight structure. A more detailed description of the calculation method is available in the updated Producer Price Index for Manufactured Products and Producer Price Indices for Services 2015=100 Handbook for Users to be published in spring. These changes improve the quality of the Index, because with their help, structural changes in production, exports and imports can be taken into account faster in future. ISSN=1799-3695. January 2019. Helsinki: Statistics Finland [referred: 21.4.2019].